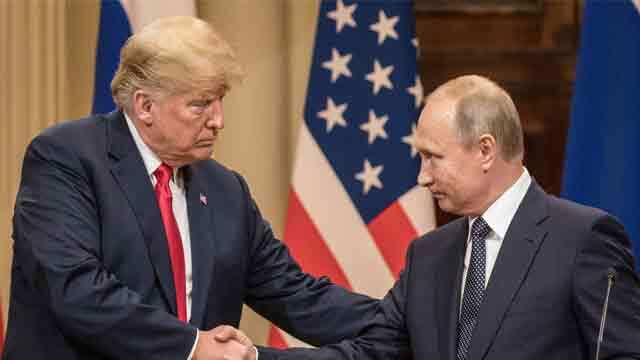 Washington, July 20 (Just News): President Donald Trump has invited Russian President Vladimir Putin to Washington this autumn, the White House says yesterday, a daring rebuttal to the torrent of criticism in the United States over Trump's failure to publicly confront Putin at their first summit for Moscow's meddling in the 2016 election. What happened at Monday's one-on-one between Trump and Putin with only interpreters present remained a mystery, even to top officials and US lawmakers who said they had not been briefed. Trump's director of national intelligence, Dan Coats, said in response to a question at the Aspen Security Forum in Colorado: "Well, you're right, I don't know what happened at that meeting." Both Trump and Putin earlier on Thursday praised their first meeting as a success and blamed forces in the United States for trying to belittle its achievements, Trump citing discussions on counterterrorism, Israel's security, nuclear proliferation, cyber attacks, trade, Ukraine, Middle East peace and North Korea. In one Twitter post, Trump blamed the media. "The Summit with Russia was a great success, except with the real enemy of the people, the Fake News Media." In Moscow, Putin said the summit "was successful overall and led to some useful agreements" without elaborating on the agreements. Top Senate Democrat Chuck Schumer criticized the invitation. "Until we know what happened at that two hour meeting in Helsinki, the president should have no more one-on-one interactions with Putin. In the United States, in Russia, or anywhere else," he said in a statement. Coats, who on Monday roundly defended the intelligence agencies' findings of Russian meddling, also advised against a one-on-one meeting with Putin, saying he "would look for a different way of doing it." A senior White House official said Bolton extended the official invitation to Putin on Thursday via his Russian counterpart. No date has been set and it was unclear whether it would be timed for the UN General Assembly in late September. The week was one of the toughest for Trump since he took office 18 months ago as aides struggled with damage control and convincing Americans that the president did not favor Russian interests over his own country's. Forty-two percent of registered voters said they approved of Trump’s overall job performance, according to a Reuters/Ipsos opinion poll taken after the summit. Bolton on Tuesday laid out four talking points for the crisis-hit White House, according to one official: that Trump stress he supports US intelligence agencies, that there was never any Russian collusion with his campaign, that Russian meddling is unacceptable and the United States is doing everything it can to protect elections in 2018 and beyond. With Trump under fierce criticism in the United States, the White House on Thursday rejected Putin's proposal that Russian authorities be present for the questioning of Americans it accuses of "illegal activities," including a former US ambassador to Moscow. It was the latest about-face in a week of multiple reversals. Critics complained that Trump was given ample opportunity at a joint news conference on Monday to scold Putin over Russian interference in the election but instead accepted Putin's denials over the word of American intelligence agencies. Trump on Tuesday said he misspoke during the news conference. On Wednesday, Trump answered "no" to a reporter's question on whether Russia was still targeting the United States, only to have Sanders say later he was saying "no" to answering any questions - not to the question itself. Republican and Democratic US lawmakers grappled with Trump's conflicting statements as they discussed ways to show their opposition to what they saw in Helsinki, including strengthening sanctions. Putin indicated he would permit American law enforcement officials to observe questioning by Russian officials of the indicted Russians and vice versa for Russian investigations. He mentioned London-based financier Bill Browder, a onetime investor in Russia who said he exposed corruption there. Standing alongside Putin, Trump called the idea "an incredible offer."